IMUSA Citrus Juicer will be the main squeeze in your kitchen. 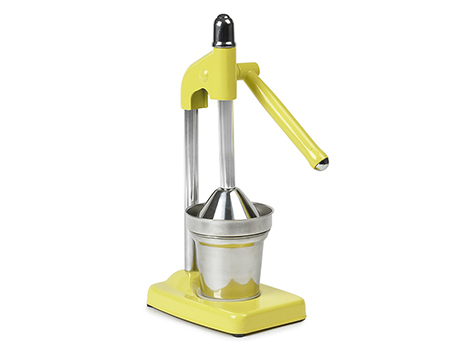 The sleek, contemporary design provides an easy to use one lever operation when making juice. The sturdy cast base and non-slip rubber feet provide stability when squeezing your favorite citrus fruits. A stainless steel strainer separates seeds and pulp from the juice as it flows into the matching stainless steel cup. Try fresh orange or grapefruit juice at breakfast for a healthy start to your day or freshly squeezed lemons for a homemade lemonade that will impress your guests! 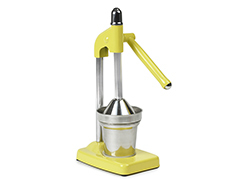 The manual juicer extracts juice from oranges, lemons, limes, grapefruit, and other citrus fruits easily and efficiently.